Mix butter, oil , eggs and powdered sugar in a bowl. Knead a dough by adding flour, baking powder and vanilla. 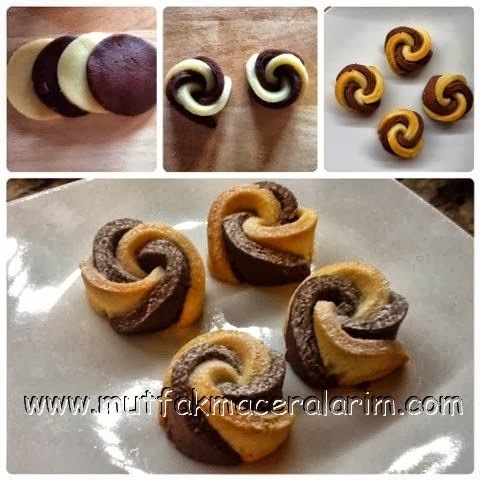 Divide the dough in half, add cocoa to one part, leave the other half so get two different colors . Roll both halves of dough 1-2 mm thick then cut circles with the help of a glass. Arrange 4 circles as seen in the picture. Roll these circles carefully & cut in half to obtain 2 roses. Put the cookies on a baking sheet. Cook the cookies in a pre-heated oven at 180 degree celcius until they become lightly browned. Leave the cookies cool for 25-20 minutes then sprinkle with powdered sugar & serve. Enjoy your cookies! Diced beef is braised in a pan until it gets tender. (aprox: for 1,5 hours) Boiling water is added if necessary while cooking. Diced onions are cooked in a pan with red pepper paste with 2 spoons of oil. Cooked meat, onion & garnish are put together. Melt the margarin. Beat the egg, sugar & milk with a mixer. Add the melted margarin while mixing. Add also the flour, vanilla & baking powder. Cut the bananas in small pieces. Add bananas & chocolate chips into the dough. Mix all with a spoon. Then distribute the dough into muffin molds. You can put some chocolate chips on dough after distributing to get a better look. Cook the muffins in the oven set to 170 C until they get a nice colour. 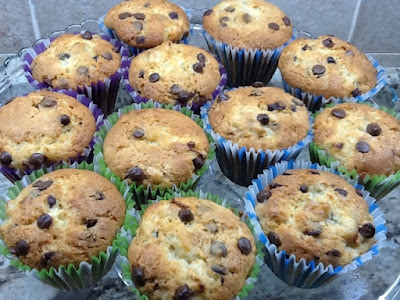 Enjoy your muffins!